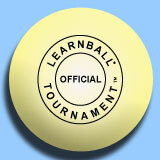 To implement Learnball, you will need the following materials. Hoop (to use with official Learnball Teamwork foam ball)- This can be purchased at local toy stores. The League recommends a plastic hoop with break-away rim. They range in price from approximately $30.00 to $60.00. The hard plastic ball that comes with the set should be discarded. In addition, do not purchase the metal hoops for classroom use.